and onions. Stir in dill, cover, and chill at least 1 hour. I've never tried making cuke salad with boiling brine. Did it make the cukes soft, Lucky? these are crisp even three days later ! 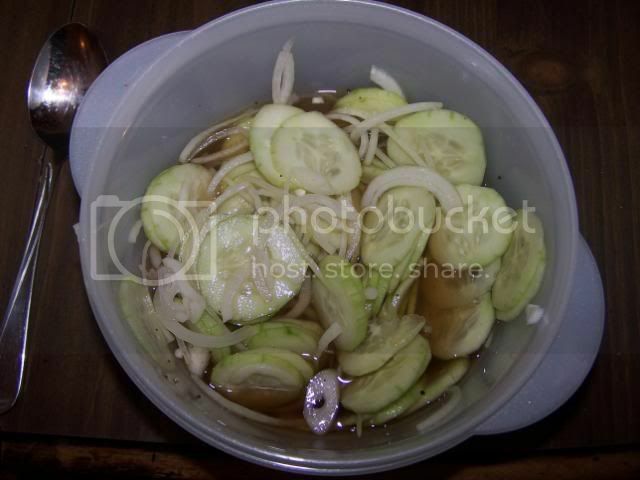 The boiling does help to dissolve the sugar, as well as infusing the cuke's with the flavors. Sounds & looks good LT. I also used balsamic vinegar in a similar recipe, a bit sweeter but one of my favorites. I've actually tried an number of vinegars with cucumbers using pretty close to the same recipe. All have a little different taste but have yet to find one I didn't like. Yum! I love cucumber salad. Thanks for the recipe. By the way LT, would it be possible to make this using equal instead of regular sugar? yum-yum on Granny's salad! i've tried it only creamy. would be a great appy. I've made it with Splenda, when I was doing South beach, and it worked fine. My Polish Aunt Stella used to make Lucky's Granny's Salad, too, when I was growing up. I don't remember if she put onions in it or not, and I don't, when I make it. I just make one serving at a time, making the brine first, just mixing water, sugar, salt, pepper and cider vinegar until it "tastes right". Then I add chopped fresh dill (fresh dill makes it). I slice part of an English cuke on a mandolin and let the slices soak in the brine until I'm ready for dinner. Brown about a T. of butter. Pour off most of the brine and then drizzle the hot browned butter over the cukes. Serve immediately.